2 Add a new property from the Projects menu, choose your Agent and tours options. 3 Upload your media (photos, 360°s, & videos) assign 360° links & publish. You and the Agent get notification of the delivery with a link to the agent's media resource page. Precisely what you need for fast professional delivery and hosting of your photography, videos, and 360° Equirectangular images. For the same cost of cloud storage, we’ll size and package images, host videos and 360° images,and notify your client. Your media is presented on a client dedicated web page specifically designed to be easy to use. Delivery Packages start at $10 per month. The Basic Package includes a free trial period of 30 days and two 360° virtual tours. You will be able to store about 20 properties. We can create an immersive virtual tour where your images, videos and 360° are accessible from one MLS syndicatable link. Buy tours as you need them for only $7 or in bulk and save a little, they expire when you delete the property from your storage. to 40 average active properties. Nope, you are gonna have to call us! Fast with just the features you need. MLS-Delivery is a cloud-based solution proving time-saving tools that real estate photographers need to deliver and host photographs, videos and 360°. We help you collect, organize, present, host and deliver media and manage clients. Opt to create MLS compliant IMMERSIVE virtual tour for syndication on the web. You can manage and access media and immersive virtual tours anywhere, from any device. Featuring a no-fuss design made to streamline your workflow makes it simple for both you and your client. It’s uncomplicated design is easy to access; agents download files from a graphical interface, and copy tours links with a mouse click. Add your agent to your client database, input the address, upload your files, review and arrange your media, and then click publish. We format your image files for web and print applications, zip the images, host your video on an MLS compliant link, and create dedicated agent page containing all their properties! We'll send you and your client a text and email when the media is ready for download. One syndicatable link puts all your media in MLS. We create an unbranded slideshow virtual tour, containing photos, 360° image viewer, and mp4 video tour that is MLS-compliant. For a more immersive viewer experience, assign a 360 to a still image, enabling a simple mouse click to view a 360 of the room. Improve your visibility on the web with robust SEO strategies that embrace social media. Enjoy a personal portfolio page on two websites so you can market your work to the world. Social media postings, strategic linking, and your branding. Besides a powerful & easy to use Media Delivery System, MLS Delivery is packed with sweet features that wait to be discovered. YOUR client has a dedicated page that provides easy access to all the properties you have delivered. Accessible clients pages specifically designed for use by Real Estate Agents, provides your client one web page to collect images, copy tour links, share tours on their social media. The client delivery page features a super easy to use graphical download interface where they can choose individual images or download them all as a compressed zip file. Click to copy tour links, pictures, videos and downloads remain active until you remove them. Because everyone needs a little help now and then we provide in-page resources to help your clients unzip files, access checklists that help market your services and prepare clients for your arrival. The Client media delivery page displays your contact information and a brief image usage rights statement establishing your copyrights to the image. Resources to help your business deliver "big-box photography shop" products such as virtual tours, videos, checklists, terms of service documents, and client data management. You won't need to use expensive and complicated online cloud services, or costly photography delivery services that offer stuff that you can't use or don't need. No convoluted mix of software, apps and web services, it's all here in one place. Your Dashboard Manage your clients, properties, and media from your private dashboard, analyze your business, and manage clients, your subscription, and Tours in one place. Your Portfolio Page Elevate your presence on the web with a personal portfolio page containing the shoots you want to display and all your contact information on MLS-Delivery.com and our sister-site MLS360Tours.com. 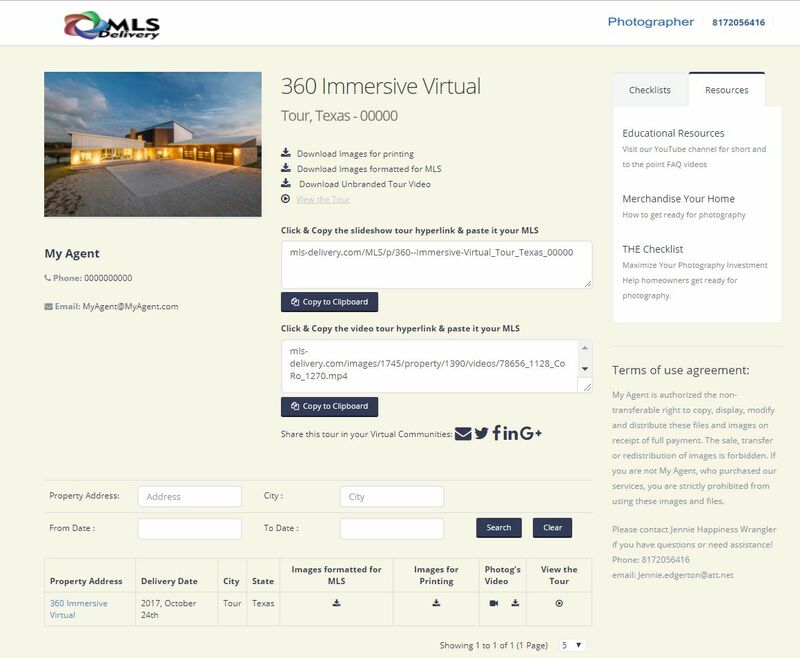 As a subscriber to MLS-Delivery, you become a member of MLS-360Tours.com, an SEO and web-friendly marketplace featuring real estate photographers and their work. Your biography and portfolio page are linked and displayed to help you leverage your brand on the web. If enabled, we'll list you on our sister site MLS360Tours.com a digital marketplace to find photographers. Every published tour is posted to MLS Delivery's Facebook page with you and your client's information. Published unbranded Mp4 videos are hosted on our YouTube channel. Embedded with rich metadata content, every tour link contains your name in the path. Equirectangular images for full spherical viewing of 360° by 180° images. Images from any camera in a jpg format with a 2:1 ratio work perfectly! Upload still images, 360° images and mp4 videos for an immersive tour. For a richer experience link your 360°s to the still images. No camera-specific XMP (Extensible Metadata Platform) or Exif (Exchangeable image file format) tags required. Tours as only you can imagine them. Slide through detailed still images. Watch a dramatic video of your drone flyover. Get a 360° view of the property exterior with a click. Upload your floor plan as a JPG image for a more profound experience. Load as many photos as you like. Let viewers enjoy a tour of the property where they choose what to see. Tickle your client with easy social sharing; let your work soar on the web for the world to see! These 360° images were made using a Ricoh Theta V and a tiny bit of post in Photoshop. Equirectangular 2:1 jpg, captured with any rig will work. DSLR mounted on a Nodal Ninja, your iPhone, or something you stitched together in photoshop or PTGui; it'll play! Click the "Sign Me Up" button below to launch an email. Please provide us your contact information, and we will take care of the rest. You will receive a call and a confirmation email from Jennie, The Happiness Wrangler. come on ya'll where else would we be? We are happy, chatty people who would love to talk about how our business can help your business. Call, email, text, tweet, Facebook message, or send a raven; we’ll get back to you as soon as we can. If we don’t answer super fast we are doing what we love most of all, coding new features for MLS-Delivery. Helping real estate photographers deliver and host digital marketing media. Socially enabled, intuitive, and fast media delivery designed photographers. Your clients see your branding in an accessible, elegant and simple to use graphical user interface. add 360° to your mix of offerings! © 2015, 2016, 2017, 2018, 2019 All rights reserved - MLS-Delivery.